It might sound far-fetched, but Quantum Physics is the starting point to understand and photograph leopards. Everything is made of the same energy and everything is connected to everything else is an essential lesson from Quantum Physics, that applies to us as it applies to leopards, a coffee mug and the car we are driving in. Because we are all made of the same energy, we are also all connected and communicate on the energy level all the time, mostly without being conscious about that, although we use phrases like “we are on the same wavelength” with somebody or not. So somehow we know that we are communicating on frequencies like radio channels and some people can receive the signals and some don’t or receive only distorted messages. That means that the energy we are made of vibrates or moves in different frequencies, higher or lower frequencies, faster or slower. We might experience situations where we immediately have a good “click” with somebody. Most likely this persons communicates on energy level on the same frequency as we do. When we experience a situation that we find it difficult to be in the presence of a certain person for too long, because we start to feel tensed and restless, like pressure is building up, we might have an encounter with somebody of a high frequency energy and our energy frequency finds it hard to adjust to the same level. In the other direction to a lower frequency the adjustment is easier and mostly not experienced as demanding or unpleasant. But what does all that have to do with photography and especially leopard photography? An easy answer could be, wait until you look one into the eyes, but it is helpful to know what happens when you are in the lucky position to be near a leopard and able to spend time with the animal. The difference in photographing wildlife in general and leopards in particular is the very high frequency energy this incredible cat has. Being conscious about that helps a lot when photographing them. Imagine you are on a game drive and suddenly there is the leopard you were looking for already for days, right in front of the vehicle on a termite mount. Now just shoot away. Don’t think. Let the adrenaline from the excitement out and also take the pictures you can get, before the leopard possibly disappears. This moment might take a minute or two. You will feel when the excitement has settled and you will sit more relaxed in the vehicle. First thoughts of how to photograph the leopard properly will pop up. The next thing might be a feeling of impatience and negative thoughts about the light, the not doing anything animal, chaos with the camera settings, maybe a bit cursing, annoyance and eventually anger why we are still here with this leopard, enough leopard. This is a very important moment. When you decide to leave the sighting, you will miss the chance to connect with the animal and to get the most beautiful photos. All the negative thoughts and the physical reactions of feeling uncomfortable are caused by the difference in energy vibration/frequency. The leopard as a high frequency animal is just sitting there and doing nothing, only sending out on his/her frequency and your energy is trying to tune in to the leopards energy frequency. This tuning process causes the uncomfortable feeling. It will disappear as soon as you are tuned in and from there its as easy as what to photograph this amazing animal and to get the most beautiful leopard images. Be patient. Stay with the animal and give yourself the time to tune in. 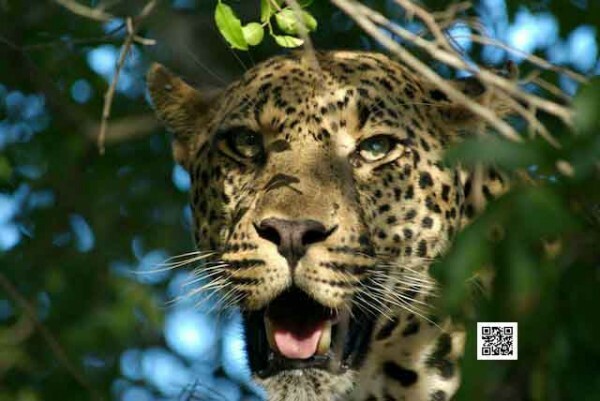 As soon as you are tuned in on the leopards frequency the whole “energy situation” on the sighting will calm down and all present parties will connect on the same level. The leopard will start doing his/her thing and the most incredible photo opportunities will occur. Try it at home with your cat and get trained for the big cat! This entry was posted on Saturday, July 28th, 2012 at 7:57 pm. It is filed under Action, HOMEPAGE MAIN PICTURES, Stories and tagged with leopard, leopard safari, photo safari. You can follow any responses to this entry through the RSS 2.0 feed.